This model was created to help you understand the knowledge, skills and abilities you’ll need to be ready for dynamic career and life possibilities. The model features four Core Themes (in the middle) and two Meta Themes (the outer circles) which are interwoven through each of the Core Themes. Your college experiences, such as classes, internships, study abroad, part-time work, and co-curricular activities play a unique role in helping you develop within the various themes. Additionally, our Career and Life Success Guide provides action steps to help get you ready for a lifetime of success. An ability to identify and manage your emotions and recognize their impact on others by applying critical thinking, problem solving, and communication skills. 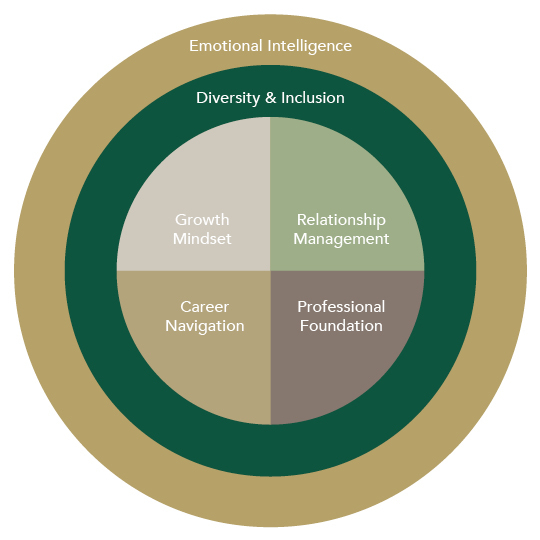 The Meta Theme of Emotional Intelligence is interwoven into each of the four core themes below. An understanding of individuals' similarities and differences while valuing and respecting others' perspectives and backgrounds. The Meta Theme of Diversity & Inclusion is interwoven into each of the four core themes below. The belief that you can improve upon your abilities and change your perception of success through practice, effort, and continuous learning. An ability to develop, foster, and maintain various types of meaningful relationships throughout your life and career. Knowledge of personal factors that influence career decision-making and ability to intentionally explore and develop your career. Knowledge and skills you need to effectively compete for internships, jobs, graduate school and other opportunities.